"I've had nothing yet," Alice replied in an offended ton: "so I can't take more." Meanwhile, let us have a cup of tea...Let us dream of evanescence, and linger in the beautiful foolishness of things. Tea time. Dull grey clouds, dark driving rain, cold skies with a hint of blue all call for filling the kettle with fresh cold water, standing in front of the shelf with the varieties of tea, and brewing up a pot of warm delight. 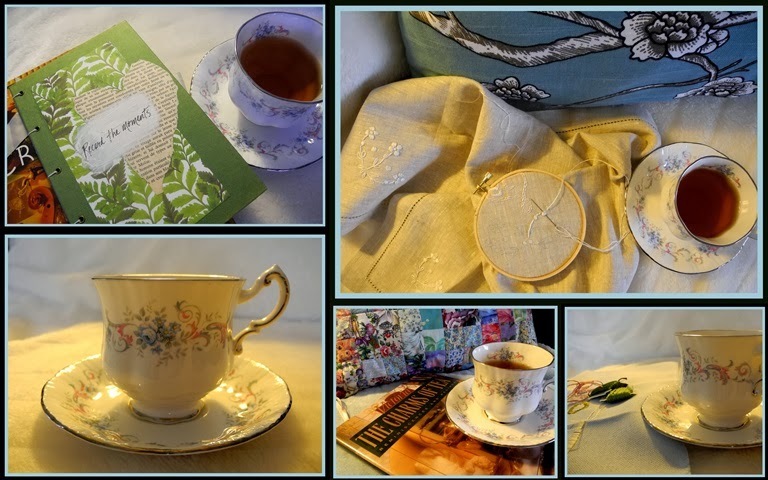 Tea and stitching, tea and reading, tea and blogging, tea and talking, tea and thinking. Such a versatile beverage! These are my offerings for Vee's Note Card party. The last image would be the box cover, and you'll see I sneaked in another photo. You can be certain that I'll have a cup of tea to hand as I peruse the other party attendees' photos. Here's to tea! What a calm and peaceful teatime you've arranged for us, complete with beautiful poetry to complement the mood. I have read Kazuko Okakura's quote several times to myself, just now, and am taken with its whimsy! PS: Your teacup is so very pretty! Hi Lorrie, Love your tea talk and tea vignettes. Very pretty! Ah a lovely tea post and it is such a welcome tonic for these grey days. I'm sipping some right now. Oh and your embroidery looks lovely. Is it a linen tea towel? Tea and...i do agree. Tea goes with everything for me. Lovely post. Perfect for "tea month" -- these are just so special. Lorrie. It seems with each notecard photo you show something you could do while drinking your cuppa. Speaking of, it's time for me to go get a cup. I like the yellow coloring or lighting in your photos--makes it look very warm and cozy! Amazing what lighting can do for a photo. Lovely photos. We have both written about Tea today! Beautiful, Lorrie! I especially love the combination of the china and embroidery floss. I wish I had made myself a cup of tea before I saw down! What a lovely post and pretty stitching. I love the quilt in the background, too! Stay warm and enjoy your evening! Hugs! Oh Lorrie, I'll drink a cup of tea to your beautiful note cards. What a lovely box cover you've made for them, too. Wonderful!! I think you've hit the nail on the head Lorrie with how versatile tea is. I'd certainly buy a box of your tea themed note cards and the box top is very nice. What a lovely tea cup and drinking tea goes so well with all your activities. They make very pretty note cards. Thanks for taking the time to visit me and your nice comment. Very nice! And I love your stitching!!!! Oh Tea! One of my favorite things! Lovely, lovely, lovely! Perfect! Love your tea cups. Yes! Tea goes with all those pursuits and just for dreaming. I am now dreaming of tea and a book, maybe sitting under a quilt. I love all the cards - the settings and designs are so artistic - and the quotes fit perfectly. Wonderful time for tea. I have some needlework I really want to get to . . . I just need some time, and a big pot of tea! Thanks for the lovely inspiration. I love these images, and adore the journal. I'm feeling inspired! thanks for sharing. Your header looks very nice, too! Your blog is so ELEGANT . Makes me feeling elegant myself by looking at it . I try to think what I hall do for change my blog imago a bit . I'll try . There's nothing like a cup of tea any time of the day for any reason Lorrie! I love your theme this month and your creativity making these cards - each one has it's own story. Your embroidery looks lovely - is it a tea cloth? Such beautiful images; I love the tea cup and the stitchery. A lovely collection of photographs. Lorrie! This is lovely! The cup is just beautiful - one of my favorite shapes and artistic design types. So feminine. And, your stitchery is perfection! Love the journal, too. I've been busy with fabric flowers and my paper art has taken a back seat of late. But, I love working in so many media types - it's hard to make time for all. However, you've convinced me - time for tea, to be sure! Tea and winter just seem to go together in my head. You know, kind of like fall and pumpkin latte. I loved every shot you had here, and my favorite one of all is the one with the journal. Did you make that? It's really lovely to me. lovely photos . . . lovely words . . . a cup of tea . . . all make for a wonderful day. These cards are perfect for the cold January days, Lorrie. I love your pictures and the verses you've chosen to go with them. I adore your teacup and saucer; that china pattern is just beautiful!! Your needlework piece looks very similar to an embroidered table topper my mother-in-law brought me from Ireland several years ago. It even has the hemstitch trim like yours. It sounds like you're having the kind of rainy winter that we had last year. After a while, it just felt like an endurance contest. I hope you get some sunny days very soon, Lorrie! Your note card offerings are delightful! And now I am off to brew a cup of tea. Lovely post both in terms of text and pictures. By the way you left a comment on my recent post which I tried to publish and it seems to have disappeared - sorry about that! I have gone back to not needing to approve comments so things should be fine in future! I love your collection of photos with the beautiful tea cup! They make wonderful note cards. The patchwork pillow in the first photo is very pretty, too! Delightful choices for a box of cards Lorrie - a real china cup and saucer is hard to beat, and I love your white on natural embroidery - Queen Ann's Lace perhaps?